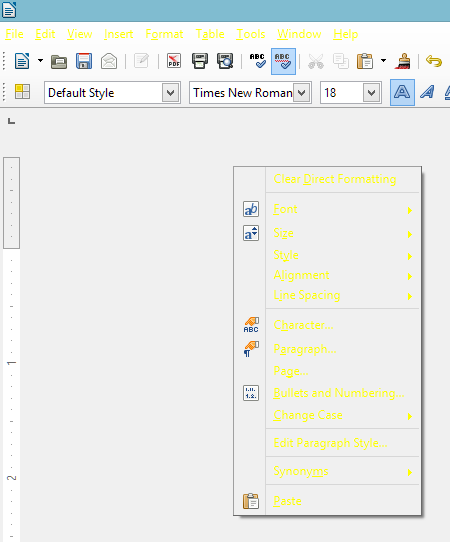 I opened LibreOffice Writer one day and suddenly the buttons have changed color. I've tried looking through the options and couldn't find one that would change the color of the text. Could this be a bug? It seems that changing the contrast on and off from the Control Panel>Appearance and Personalization>Personalization>High Contrast Themes (I used "High Contrast #1" in this case) was able to 'reset' the menu buttons to its normal, black color. You indicate in your message the buttons have changed color, but the screenshot shows that these are the menus? You do not indicated what is your operating system (linux, windows, mac). In theory that shows your screenshot is not managed by LibreOffice, but by the system. Another explanation: problem with Tools▸Options▸LibreOffice▸Accessibility▸Use automatic font color for screen display and/or Automatically detect high contrast (try to check/uncheck).